Cebu Pacific is benefiting from a significant improvement in market conditions in the Philippine domestic market. The LCC group has built up a powerful 60% share of the domestic market compared to less than 30% a decade ago. Cebu’s acquisition of Tigerair Philippines has so far proven to be successful as it has been able to quickly turn around the carrier while using the new subsidiary to further grow its domestic market share. Tigerair Philippines should be profitable in 2015 while it starts to contemplate a re-branding to reflect the fact it is 100% owned by Cebu Pacific. This is the third in a series of analysis reports on the Philippine market. The first two reports looked at the performance and outlook of Cebu Pacific’s long-haul operation with a particular focus on the Philippines-Middle East and Philippines-Australia markets. This report examines Cebu Pacific’s domestic performance and outlook, including the turnaround at new subsidiary Tigerair Philippines. Cebu Pacific Air captured a 54.4% share of the Philippine domestic passenger market in 2014, based on Philippine CAB data. Cebu Pacific surpassed the 50% mark for the first time in 2013, when it captured a 50.4% share. Five A320s which previously operated under the Cebu Pacific operators' certificate were transferred over to Tigerair Philippines, which Cebu Pacific acquired in Mar-2014. The original five-aircraft fleet of Tigerair Philippines were returned to the Tigerair Group shortly after the acquisition was completed. Tigerair Philippines carried 1.3 million domestic passenger in 2014 compared to only 970,000 in 2013. The carrier was able to grow domestic passenger traffic after it was taken over by Cebu Pacific through a combination of higher load factors, improved aircraft utilisation levels and reductions to its international operation. The combined Cebu Pacific and Tigerair Philippines figure of 12.38 million domestic passengers in 2014 equates to a 60.8% share of the total Philippine domestic market. When excluding the passengers Tigerair Philippines carried from 01-Jan-2014 to 20-Mar-2014, when the sale to Cebu Pacific was completed, the Cebu Pacific Group accounted for almost exactly 60% of the Philippine domestic market in 2014. Reaching the 60% market share figure is a significant accomplishment – even if it was only made possible from inorganic growth. As CAPA commented in Jan-2014 when the purchase of Tigerair Philippines was first announced, a potential 60% share of the Philippines domestic market gives Cebu Pacific a powerful grip on the market. See related report: Cebu Pacific poised for further Philippine domestic market share gains in 2014. Is 60% achievable? Back in 2005 Cebu Pacific captured only a 27% share of the Philippine domestic market. 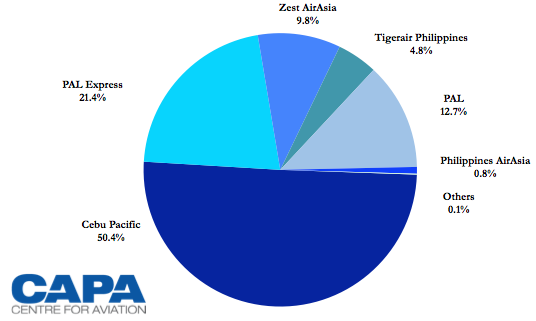 Philippine Airlines (PAL) in 2005 captured a leading 52% share of the domestic market. 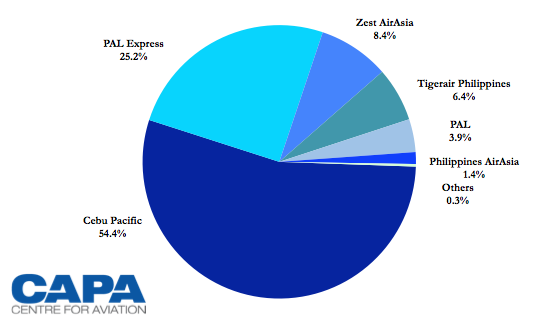 PAL had a 63% share of the market in 2015 when including sister carrier PAL Express, which at the time was known as Air Philippines. Cebu Pacific overtook Philippine Airlines as the largest single airline in the Philippine domestic market in 2007. It subsequently overtook the PAL Group in 2009 as the largest player. 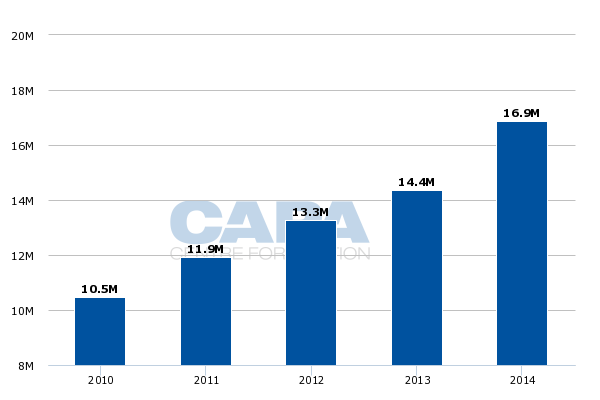 The PAL Group’s share of the domestic market slipped to only 29% in 2014. As a result Cebu Pacific and PAL have essentially switched places over the last decade, with the PAL Group share shrinking by 24ppts from 63% in 2005 to 29% in 2014 and the Cebu Pacific Group share growing by 23ppts from 27% in 2005 to 60% in 2014. The PAL Group’s 29% share for 2014 included a 25.2% share for regional full-service subsidiary PAL Express, which recorded domestic passenger growth of 18% as it took over several routes from PAL mainline. PAL mainline, which now only operates on the two largest trunk routes, captured only a 3.9% share of the domestic market as its domestic traffic dropped by 69%. The AirAsia Group accounted for most of the 11% share of the Philippine domestic market that was not captured by the Cebu Pacific or PAL groups. AirAsia captured a 10% share in 2014, including an 8.4% share for Zest AirAsia and a 1.4% share for Philippines AirAsia. 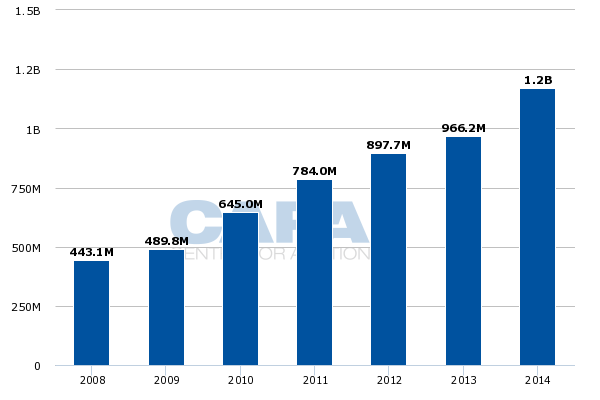 Both carriers recorded declines in passenger traffic in 2014 as AirAsia restructured its operation in the Philippines as part of a turnaround attempt. AirAsia’s Philippine operation as well the PAL Group outlook will be analysed in separate instalments in this series of reports on the Philippine market. The AirAsia Group entered the Philippine domestic market in 2012 when it launched Philippines AirAsia. Zest, which had been serving the Philippine domestic market for two decades (originally as Asian Spirit), merged with Philippines AirAsia in 2013. The carriers have since continued to operate under their own AOCs. The consolidation has led to a dramatic improvement in market conditions. 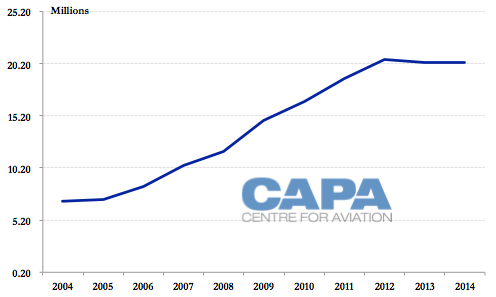 Total domestic capacity in the Philippines has dropped over the last two years while overall annual passenger numbers have been flat. As a result yields and load factors have improved. The rapid growth from earlier this decade was impressive but not sustainable as overambitious capacity expansion pressured yields and load factors. While most of Southeast Asia suffered from overcapacity in 2014, the Philippines market benefited from capacity discipline. 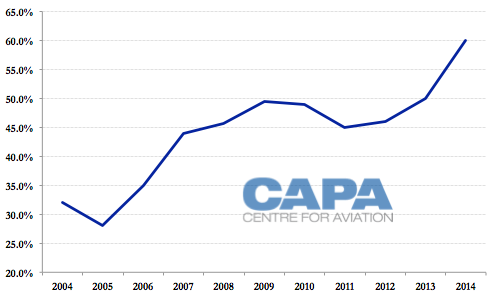 As CAPA previously analysed, only six airlines from Southeast Asia reported an improvement in profitability in 2014 compared to 2013. Four of these airlines were from the Philippines. Cebu Pacific turned a net profit for 2014 of PHP1.013 billion (USD23 million) in 2014, representing a 98% increase compared to a PHP512 million (USD12 million) net profit from 2013. These figures exclude Tigerair Philippines. As CAPA analysed in the first instalment in this series of reports, Cebu Pacific’s long-haul operation incurred a loss of around PHP1 billion (USD23 million) in 2014. As a result Cebu’s short-haul operation turned a profit of about PHP2 billion (USD46 million). This includes regional international routes but Cebu’s short-haul international business likely only turned a modest profit. Competition in the Philippine regional international market continued to intensify in 2014, pressuring yields and profits. Meanwhile domestic market conditions improved significantly with Cebu Pacific being the largest benefactor as it is the market leader. Cebu Pacific also reported a net loss of PHP160 million (USD4 million) at Tigerair Philippines for the slightly over nine months of 2014 that it owned the carrier. Revenues at Tigerair Philippines during this period were PHP2.8 billion (USD63 million). Tigerair Philippines accounted for 5% of Cebu Pacific’s total PHP52 billion (USD1.17 billion) revenue stream for 2014. It marked the first year Cebu Pacific passed the USD1 billion revenue milestone. Cebu Pacific recorded 27% revenue growth in 2014. But when excluding Tigerair Philippines the growth was a slightly more modest 20%. Based on financial reports from the Tigerair Group, Tigerair Philippines incurred a loss of about USD15 million for the period of 2014 that the airline was still partially owned by the Tigerair Group (01-Jan-2015 to 20-Mar-2015). As a result Tigerair Philippines incurred a loss of about USD19 million for the full year – with almost all the losses taking place prior to the sale to Cebu Pacific. While an improvement in domestic market conditions helped, the turnaround at Tigerair Philippines is driven almost entirely by initiatives implemented by Cebu Pacific. As CAPA outlined in May-2014, Cebu Pacific was able to significantly improve Tigerair Philippines' financial performance almost immediately by rationalising its network, increasing aircraft utilisation levels, boosting yield by selling flights through the Cebu Pacific distribution system (including the Cebu Pacific website) and reducing costs by leveraging Cebu’s existing contracts and scale. Tigerair Philippines currently operates 18 routes, 10 of which were launched since Cebu Pacific took over the carrier. Two of these routes were launched at the end of Mar-2015 – Manila-Legazpi and Cebu-Puerto Princesa. Cebu Pacific also serves both of these routes as well as all the other domestic routes operated by Tigerair Philippines. Meanwhile Cebu Pacific has cut back the Tigerair Philippines international network to just one destination, Hong Kong. As a result Tigerair Philippines does not provide Cebu Pacific with much of a network benefit. The main and perhaps only attraction were Tigerair Philippines’ slots at Manila, which have enabled Cebu Pacific to add frequency on several domestic routes and further growth its domestic market share. Cebu Pacific is not planning to pursue further growth at Tigerair Philippines – which is hardly surprising now that it is fully utilising the carrier’s slots and has boosted aircraft utilisation rates to normal LCC levels. The group is expected to rebrand Tigerair Philippines at some point – likely by the end of 2015 – but keep the carrier as a separate subsidiary with its own AOC. Cebu Pacific is optimistic Tigerair Philippines will be profitable in 2015 as it has identified opportunities to further reduce the carrier’s costs, which are now close to but not quite at Cebu Pacific levels. The outlook for the group’s overall domestic operation is bright as market conditions remain relatively favourable. The PAL Group has been pursuing some domestic expansion but not enough to have a significant impact on the market and distort the current supply-demand balance. AirAsia meanwhile is mainly focusing on the international market and is a relatively small domestic player with its less than 10% share. There is little risk at this point of anything denting Cebu Pacific’s strong domestic position. The group should again surpass the 60% domestic market share threshold in 2015 – this time by a wider margin. Challenges remain in the international market but the profitable domestic operation gives Cebu Pacific the luxury of patience as its long-haul unit gradually spools up and improves.